1827 The last of August I left for New York Camp, on arriving there I spoke once or twice. The same as to other places, out Camp-meeting was not as great as I have seen before. I spoke in both the Churches. We had a good time together, rejoicing in the Lord. I left then for Albany; had a pleasant passage up the North river, on hundred and sixty miles; the mountains and their other places our camp-meeting was not as great as I have seen before. I was not as great as I have seen before. I spoke in both the Churches. We had a good time together, rejoicing in the Lord. I left then for Albany had a pleasant passage up the North river, one hundreds and sixty miles; the mountains and their stupendous looks preached to me in my journey through. Oh, the wisdom of God, and how marvellous in our eyes; enough to convince the infidel, yea, the Atheist, that there is some first cause. From the effects produced, look at the ingenuity of mankind, which actually comes from God, and is displayed in building steamboats, and other great novelties in mechanism. We accomplished the route the same day we started, and I found myself entirely among strangers. But I made inquiry for Methodist friends, and found brother Streeter, a coloured family, very respectable. They treated me very kind; they were under the white Bishop, and I under the coloured. But the same faith, same doctrine, same Baptism, same spirit. Glory to God. Among the coloured people, the Baptists had the ascendancy. There was a large hall prepared for me, and we had a large congregation of different denominations. I spoke from these words and this Gospel of the kingdom shall be preached unto all the world as for a witness, and then shall the end come. God owned the word, sinners screamed; some fell to the floor, others wept, while Christians rejoiced. A lady of color was present, though she was a member of the Dutch Presbyterian Church; her husband belonged to no Church, but was under an exercise of mind. The Lord reached his heart, he mourned more than three days. They sent for me to come to their house. I paid them a visit, and held prayer meeting at their house. That Sabbath two weeks he joined the Methodist Church. I spoke three times the first Sabbath afternoon; we had a large congregation, at night still larger. Text Never man spoke like this man. God's spirit was poured out in a miraculous manner. On the ensuing third day evening I spoke again, from these words. And came seeking fruit on the tree and found none. To all appearance there was nothing done, but God directed the word to the heart of a little girl, a gentleman's daughter, between eleven and twelve years of age. She joined the Church before I left there. A good old Missionary, by the name of Mitchell, came to the city before I left, and preached three sermons, in which there was a great revival. The Elder appointed prayer meetings, north and south of the city of Albany. I preached two or three sermons in a school house, the last I spoke was in Brother Streeter's house, from St. Matt. Chap. 21 ver. 12th. I thank God for the comfortable visit I had there in the discharge of my duty. This Methodist preacher, Mitchell, had a book with him called the Essence of John Steward, a coloured man, with his miraculous call to the ministry, the first one who succeeded in Christianizing the Methodist Indians in Sandusky and that province, and he sold them in Albany, and it seemed to have its desired effect also with the revival, in encouraging us to hold a fast. ...my mind felt at liberty to leave for Schenectady. 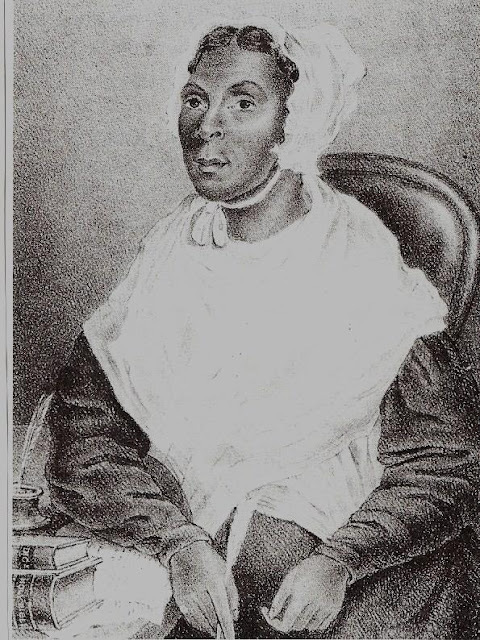 Sister Streeter rode with the fourteen miles; I stopped eleven days, at which place there was a large upper room that was appropriated for a preaching place, where I spoke to a small number of coloured persons several times. They were under the white elder, he was a friends to me, and appointed a meeting for me in the white Brother's house to speak for them. We had a favourable time. But the people, feeling and uninterested spirit in propagating the religion of Jesus Christ, I left the dust with them. Got on board a Canal boat for Utica, there I met with my own connexion, African Methodist Episcopal Church, we had a prosperous time. I spoke and had prayer meetings on board of the Canal boat. There was a pasture there notwithstanding the difficulties of this life and the people being hunted like partridges on the mountain. It deprives a man's usefulness among the people, but the work of the Lord went on, and there is no weapon formed by the enemy that can stop the work of God. Therefore we have nothing to fear. We have large and respectable congregations, and I felt strengthened in warning man to flee from the wrath to come. If signs and wonders did not follow sometimes, I must certainly die, but glory to God for refreshing showers. I led class, had prayer meetings, and took my passage on another canal boat for Rochester; had a pleasant passage. I soon found some Methodists, and our local Elder was then a smart preacher. I was there three or four weeks, and he treated me very kindly and opened my way. They erected a new brick church, basement for schools; the corner-stone was laid while I was there. The elder was a man of good repute; people of color of different denominations, but much united together. The elder held the charge from there to Buffalo, he had then a Quarterly Meeting on hand. I left Rochester with him and rode about seventy miles. Next morning I left Lewistown and rode seven miles, crossed the Lakes, on the British side. When we left Rochester the snow was ankle deep, when ten mile from Lewistown, it became dry and hard, and when we crossed the Lakes it was clear and cold, and the air very pure. I told the elder this was the first time I ever breathed pure air. I walked about a mile and the first house I stopped at was sister Holmes'. I felt strange and lonely. I waited to see if the peace of God would abide on the house. Previous to my being introduced, I arose from my chair and the power of God fell upon the people, and, it seemed to me, that God answered me. I was fully convinced that God would make bare his arm, in this part of his moral vineyard. We had a Church in Niagara; the elder made an appointment there, and forty or fifty miles round the circuit, being now about six hundred miles from Philadelphia. I felt the loss of my former companions and friends, the elder and deacon, in two days time left for Buffalo, to hold a quarterly meeting in York state about seventy miles. I commenced to speak for the people, and God owned the word, and I saw many displays of his power - the people in Niagara seemed to me to be a kind and Christian like people. The white inhabitants united with us, and ladies of great renown. The slaves that came there felt their freedom, began to see the necessity of education, and hired a white man to teach them to read and write among themselves, and have Sabbath schools. I am astonished to see so many there that came from a free state, and not take more interest in instilling the science of education among their fellow beings. The winter was cold - I never had experienced such - but very healthy. I went to a town called Niagara. I spoke in a dwelling house. The next night I spoke in the Old Methodist Church to a large congregation of respectable people. There were three ladies, one the widow of a great Judge, and one daughter and sister of first education; they sympathized with me in this important work of the Gospel of Christ. They assembled with us in our meeting. A little girl about 8 or 9 years of age experienced religion and prayed in public, and attended to their private devotion, so much for early piety. Teach the child the way he should go and when he gets old he will not depart from it. But, it is to be lamented, that so few of our children experience this early piety; the cause we must try to find out and avoid the evil effects, and not bring up our children in so much pride and heathenism. We, as a people, are generally poor and cannot support so many changes of fashion; they grow up and crave it, and of times substitute evil practices to support themselves, either girls or boys, and often bring a stigma upon; their parents and family connexions, though very respectable. Let us bring up our children in industry, for work is honorable, and it is the way to get riches and to keep them. I travelled back and forward again from Niagara to Buffalo, and had regular appointments in our Churches. We had a great opposition among the coloured people, one trying to excel the other in point of eminence. One of our preachers left us on the promise of forty dollars per year. Poor man, he was like Simon Magus who perished with his money. Our Circuit rider was absent on the Sunday of the split, but the Lord was with us. I spoke three times to the remaining part of the congregation, which was increased much by a large body of bystanders, and great good followed; and we continued to sow and gather for two or three months, and the Lord blessed our labors abundantly. Feeling I had discharged my duty, I left and crossed the Lake from Buffaloes to Fort George, and spoke about eight miles from there, it was cold and snowed very fast - it was four o'clock in the afternoon - the congregation had been there and gone. We were in a sleigh, and the driver got lost; we all brought up in a swamp, among the fallen tree tops, but we turned about and found a house and lodged all night; and spoke next morning at eleven o'clock to a quiet congregation, and the Lord was with us, though composed of all denominations. I appointed another meeting and rode about eight miles on horseback - it snowed and was very sleety - after I spoke to the people I left them for good and made an appointment for the Indians; two of the chiefs called at where I stopped to see me. I asked them to pray for us; they complied, but done it in their own tongue. I felt the power of God in my own heart. Then they held a council about it, and granted my visit at Buffalo village, about three miles from Buffalo city. We rode and got there before their worshipping hour, their school had not dismissed, after a while they dismissed school - of 50s chool had not dismissed, after a while they dismissed school - of children - and as they gathered to worship I saw an old chief come, he stood and prayed very devoutly, tears running down his cheek. I told them I had not come to worship with them, and wanted to preach for them after their worship ended. They held a council and they agreed I should preach for them, but I could not help admiring the ways as well as gestures of the children. The teachers bring them up in the English language and dress some of them in the English style, but the greatest number are clad in the Indian style; those of the old Indians in their blankets. Some of them met me from seven or eight miles round - they filled the house. It was in the month of March - it rained and snowed - yet they walked in their moccasins, and some bare-headed - they made a large congregation. Their Elder or missionary had gone to teach another tribe that day, and he only taught them very plainly, and read out of pamphlets the experiences of others. I commenced by giving out the hymn in our language, and the interpreter spoke in their tongue. Hymn thus, O for a thousand tongues to sing, &&;c. They sung it beautiful, - two long benches of them sung by note (their books printed in their own language) a very familiar note tune, such as we use in congregations. I spoke plain and deliberate and very pointed, the interpreter spoke it after me in the Indian tongue, and one of the women cried out Amen. Much weeping among them, dear reader, take notice, notwithstanding they are a nation revolted from Israel, and would not be governed. Yet they can civilized and Christianized. We might call them heathens, but they are endowed with a Christian spirit. I felt happy in my visit; the missionary wished me to speak for them that evening; but I had an appointment that night at Buffalo, after which my mind was calm and serene. I left on Tuesday, 1st of April, on my return for Philadelphia, and arrived home May 18th.